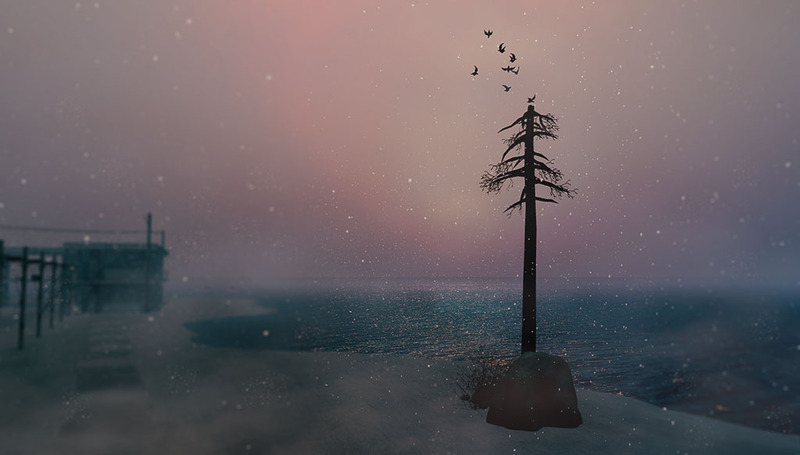 Anyone who says that Second Life is separate from real life is sadly mistaken. Whether you wander around as a nymph, Gorean warrior or super model, you are in some way reflecting the real you in a virtual world. Everything you touch, everything you create, everything you imagine is a little bit of who you are – or who you want to be. 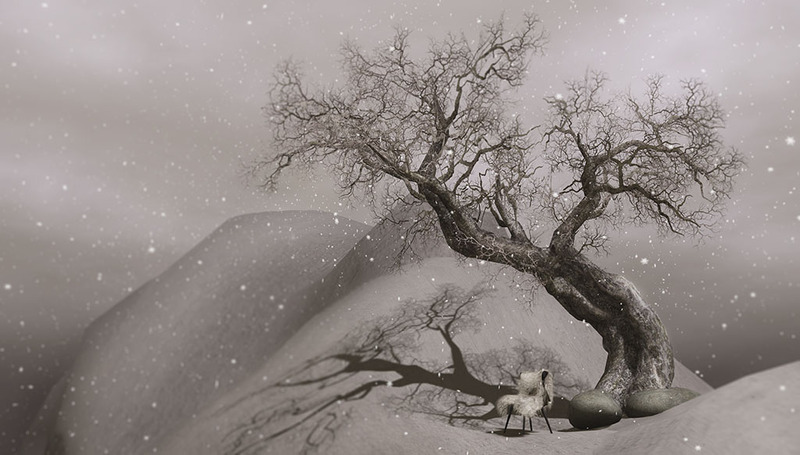 Furillen is a sim within the virtual world, Second Life. It depicts an island off the north-east coast of Sweden containing abandoned industrial builds that were once part of a former limestone factory. Remote, bleak and beautiful, this is a Second Life photographers haven. The sim now attracts around 300 visitors per day. The sim was designed to retain some of the most distinct and recognisable features of the real Furillen: the airstream, the tree line and pier, for example, together with the large slag heaps that still exist as a reminder of the old quarry. In addition, there are several buildings, the main being a hotel that – on the virtual Furillen – doubles up as an art space with a series of rooms featuring minimalist installations. This is going to be a long, photo-heavy post, so if you care to join on my journey, please continue beyond the cut. 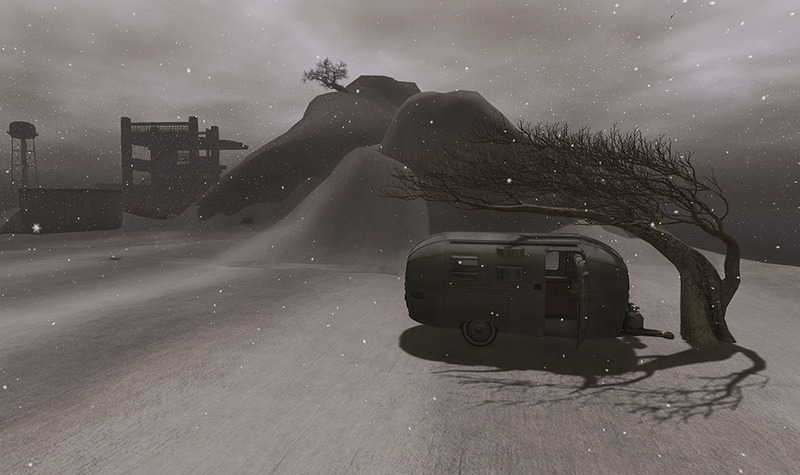 The airstream is a major focal point of the sim. A part of the real Furillen, it stands starkly against the slag heap in the distance, protected by a windswept tree. It is inviting at the same time it gives a sense of foreboding, warning those who are called to it to take heed of the ravages of this stark landscape. I opted to stay out of the caravan, instead admiring it from a distance. I could just imagine a gypsy fortune teller lurking inside, her crystal ball aglow in the darkness. I have no idea if such an entity can be found in Sweden; however, I wasn’t taking any chances and simply let my imagination win that round. My favourite part of this sim is the lone tree atop the slag heap behind the airstream. The perfect placement of the fur-covered chair is to me, the embodiment of solitude; a place to contemplate the mysteries of the universe under the protection of this majestic giant. It is as striking as it is inviting, as beautiful as it is harshly poignant. Being a Windlight snob (I’m always cycling through the settings to find the “perfect” light), I surprised myself by using the suggested setting when I landed on the sim (Bryn Oh’s Immersiva Grey Dust). All but the last photo were taken using this Windlight setting. However, while I was visiting, Serene opened a group chat with the people on the sim to ask us to switch to Region Default lighting to give him feedback on a new lighting model he had created. You can see it in the final photo (although I did take a few liberties in post-production). It is a cool blue with pink-tinged light that plays across the water – a lovely enhancement for the current winter setting. Serene is a gracious host, easily engaged in conversation, obviously the best advertisement for his labour of love. I believe this is the first time I have visited a destination in Second Life where the builder was not only on site, but freely available for a chat. It made a wonderful experience even more special to hear from the fingertips of the creator his vision and plans. My fascination with this sim began with the details. While it is notable for its open spaces and minimalist design, I couldn’t go past the loving care the Janitor of Furillen has shown in his selection of items to populate the space. You can tell this is a build of thoughtfulness. While Serene has taken pains to represent the original, his choices of liberties go far to enhance the virtual experience. From every angle – distant and close – there is a photo opportunity and a story being quietly told. Next Article Secrets, Dreams, Memories, Hope. I can tell you enjoyed your visit. Its good to get out and just have fun and not work all the time. Its like todays blog is just an after-thought and not the purpose. You nailed it, Cheri. I just wanted to get off my land for a while and punched up the Destination Guide. I really hadn’t planned on shooting photos; but once I arrived, I was compelled by the landscape. Serene is truly a gracious host who has created a little haven of beauty. It deserves to be seen. fantastic write up – thanks a lot! it was a pleasure meeting you. not all visitors are as gracious as you, it must be said !! but many are very nice – meeting them is a real part of the enjoyment i get from this place. come back soon !